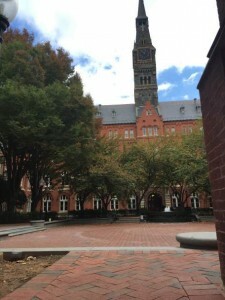 Each of the students in Gretchen Henderson’s Introduction to Creative Writing class chose a spot in Dahlgren Quad from which to write haiku throughout the fall 2015 semester. The following haiku are by Evan Couture from “spot 4.” Click through to see the metadata for each haiku or to browse more of Evan’s spot 4 haiku. No one stops to see. the brick again welcomes my hand. Copyright © 2019 The Pilgrimage Project. All Rights Reserved.